All things aside, I love that there is a "Manly" library. I know its been sent to me a few times, with various comments including those assuming that the reclassification was a serious thing that libraries were or should be doing. I've also had a few snarky remarks to those (I mean, we keep Glenn Beck and Ann Coulter in Non-Fiction...). I do not like knee-jerk policy and action, regardless of it is subject classification, stereotyping, or even law making. That being said, I found this to be rather crass and judgmental. I don't particularly care for jumping on the 'hate wagon' and I can remember some studies on this physiology (in particular concerning oxygenation and blood flow) that were quite interesting even with the revelation that he's used drugs. I don't think everything the man has done is automatically false and evil, the LIVESTRONG foundation has done good and I hope that this does not interfere with its ability to do further good. Beyond that statement I'd like to send people over to my friend's blog who talked about supporting LIVESTRONG regardless of the Armstrong scandel. To be honest, the books will likely face a quieter fate than a reassignment to Fiction. The biographies are likely to be weeded out sooner than they would be otherwise, or simply not replaced when they go missing or are damaged. Books on exercise regime may stay longer because they are not necessarily invalidated by the admissions of doping. The reality of libraries is we have finite shelf space, so as books age into displacement by discoveries they are removed from the collection to be replaced with more up-to-date information. 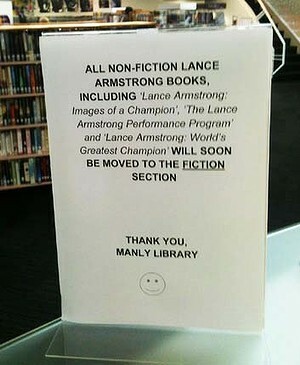 Books about Lance are going to change in tone, I guarantee that there will soon be a new biography available on the man focusing on everything that has just come out and overlaying on the stories that are already known. As it turns out the whole thing with that picture in the first place was a joke. I can understand the thinking behind a joke like that, because to be honest, as much as I found the sign to be crass and judgmental, my sense of humor can be quite a bit off color. What this whole thing for me really illustrates though is how sometimes the fear of something being taken wrong or being overly visible isn't always wrong. I am guilty of an over indulgence of "the spot light effect," but this sign in itself is rather harmless. The result is an employee is now under review. Working in the public involves an interesting balance of self-expression and concealment. You want to be an engaging personality that patrons enjoy interacting with. Your expression and personality comes out in projects, such as displays and programming. At the same time, you are under the public eye, and you need to respect that accidents and missteps can be magnified. One of the reasons I'm grateful for opportunities to do things like design displays at work is it allows me to explore the bounds of acceptable expression. I have co-workers whom I can bounce ideas off of if I'm not sure if they go to far, and get the feedback as I grow an idea before I put my foot in it. Additionally every community is different, so I'm also exploring the tastes of my current community in their reception to displays. Overall it is interesting to explore the bounds of self-expression and to develop judgement through physical projections.